Small Group, fully guided walking tour. Depart Brisbane. 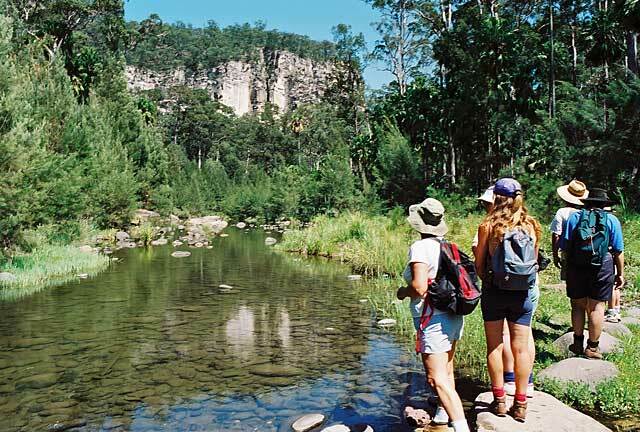 A 5 day, all inclusive, camping safari or accommodation package, will allow you time to absorb the majesty of Carnarvon Gorge, part of the 217,000 hectare Carnarvon National Park, at your leisure. 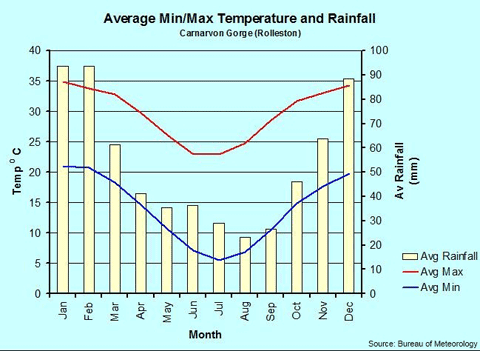 The features of Carnarvon Gorge are many and varied. Travel with Sunrover Tours and explore through easy walks and hikeing trails. Carnarvon Creek. It has cut the dramatic 30km long 600m deep gorge, out of the surrounding sandstone ranges. 20,000 years of Aboriginal history 'stencilled' onto the gorge walls. The ancient techniques displayed are considered of the highest level found anywhere in the world. A lush oasis. Fairyland moss gardens, rare giant ferns (Angiopteris), ancient cabbage tree palms and orchids to name just a few of the unusual and unique plants on show. Prolific Wildlife. Eastern Grey Kangaroos, Whip Tailed Wallabies, Pied Currawongs, Kookaburras, Bushtail possums and Goannas are your close neighbors while camping in Carnarvon Gorge. Emus, Brolgas, Plains Turkey, Echidna, Lizards and Snakes are often encountered on the drive to the Gorge. In Carnarvon Creek plataypus are common sights while bushwalking in Carnarvon Gorge. Beyond the usual Bush walks. Sunrover Expeditions experienced guide will lead you to where you want to go... to the most spectacular scenery, hidden smaller gorges, amazing lookouts and crystal-clear swimming holes... the best Carnarvon Gorge has to offer. The Magical Adventure. 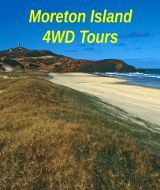 Modern 4WD vehicle, maximum of 20 guests, all camping gear (incl. sleeping bag, sheet, mattress and tent) supplied. All meals and drinks (at the Gorge) are provided (including wine with your evening meal). 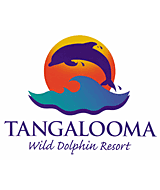 Cabin accommodation at Takarakka or Oasis Lodge provides upgraded facilities in this remote region. A short steep climb leads past Lower Aijon Falls to the small but beautiful Ward's Canyon, 4.8km from the camping area. Among the flourishing growth of mosses and ferns in this canyon is the kind fern. At the end of the canyon is a shaded pool fed by Upper Aijon Falls. A climb up a steel ladder and through a narrow rock crevice leads to a large chasm carved out by water, 4.1km from the camping area. Ferns and mosses grow on the walls and floor. The still, eerie atmosphere here leaves many people quiet and full of wonder. This is a major Aboriginal site at 5.6km from the camping area. The rock surface on which these paintings are inscribed, erodes easily: so please look and don't touch! The artists are gone and it would be a further tragedy to lose the heritage they left. By keeping on the boardwalk at this site, you will see the art to the best possible advantage. 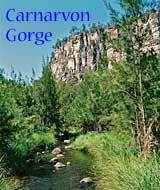 Although Carnarvon Gorge was officially discovered by Europeans in 1857, Aborigines have lived near the gorge for at least 20,000 years. 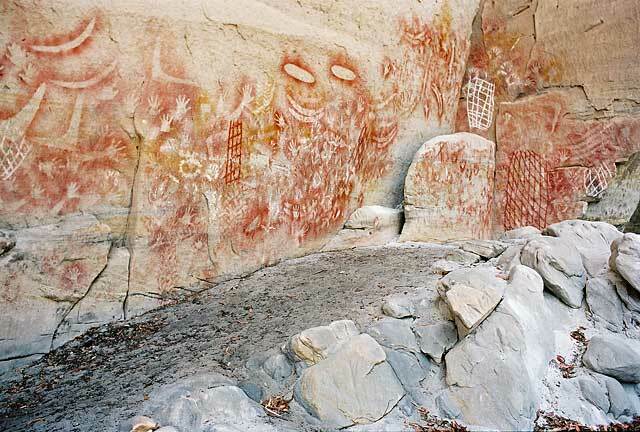 Fine examples of complex 'stencil' rock art and engravings reflect the ancient social and material culture of these people. Sunrover Expeditions' experienced guide will lead you to several of these 'sites' during your stay in Carnarvon Gorge, giving you an insite into Aboriginal culture and the art. The 500 metre track to the Aboriginal art site at Baloon Cave has been developed as a signed trail about Aboriginal culture and use of plants. It is an easy walk starting on the southern side of the road, 2km from the camping area. A series of steep, rough climbs starting from Boowinda Gorge leads to Battleship Spur. From the top, there is an excellent view of Carnarvon Gorge. This hike is not part of the walking track system, and it is not sign posted, and recommended only for the physically fit. This is at 3.2km from the camping area. After the first creek crossing, this track is to the right, off the main gorge track. The bluff is 200 metres above the gorge floor, so a series of stone steps and ladders have been built into the track to make the steep climb easier. Boolimba Bluff offers a panoramic view of the gorge and the geological components of the area can be identified. In the shelter of this large overhang, 9.3km along the main gorge track, Aborigines once spent time feasting and painting. The lower walls are covered in carving and paintings. Do not expect to see everything at a glance. Look carefully at the paintings and many exciting figures will take shape. There are no constructed walking tracks beyond Cathedral Cave, but Boowinds Gorge nearby to the left with it's narrow passages and sculptured rock walls is worth seeing. This gorge is 3km from the camping area. It is long and sinuous, and changes in detail from flood to flood. Walk carefully and thoughtfully through this beautiful gorge at 7.2km from the track start. The walking track starts at the southern end of the road, 1.5km from the camping area. An easy walk of a few hours will enable you to explore the creek and its gorges. In places, these gorges are so narrow that the sides can be touched with outstretched arms. This feature, at 3.6km from the camping area, is situated in Violet Gorge, a side gorge in the Hellhole Gorge complex. A small waterfall tumbles over a large rock overhang into an icy pool. The rock walls are dripping with water and support a profilic growth of ferns, mosses, liverworts and homworts. These small delicate plants fall easily. Early morning and late afternoon are the best times to stroll quietly along the nature trail, a short track starting on the northern side of the creek at "number 1 crossing". A pleasant, easy walk of 2km downstream from the National Park camping area leads to this large nature pool in Carnarvon Creek. The track continues 1km to meet the road. You are entering a wilderness zone. All clients required to bring own sleeping bag, pillow, water bottle and torch. 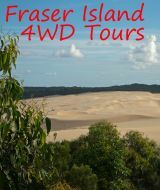 4WD tour guide will conduct some walks (longer walks available by self guide). Groups of 6 or more - departure any time on request.